Walt never shot a Nazi. But he and his artists did shoot countless feet of film for the armed forces about subjects ranging from the care of psychotic soldiers and the Burma campaign to Donald Duck setting an example for Americans by paying his income tax (when he wasn't throwing a tomato in the Fuehrer's face). In Service with Character, you'll learn about the dozens of little-known but strategically important short films that the Disney Studio made for all branches of the U.S. military, and how Walt's patriotic service to his country put his studio in dire straits. On the heels of the infamous Strike of 1941, the Disney Studio found itself besieged not by disgruntled animators holding signs but by U.S. soldiers holding guns. The Japanese attack on Pearl Harbor in December 1941 galvanized the nation, and none were more on edge than the residents of California and the West Cost. Fearing an attack, the Army took up strategic positions-and one of them was the Disney Studio. David Lesjak tells why even Walt needed identification to enter Studio property, and what the Army was doing there in the first place. Walt did much more than make training and propaganda films. Few people know that he assigned one of his best artists to create, for free, Disney-designed insignia for any servicemen who asked. These morale boosters were displayed by American military units around the world, giving soldiers a taste of home and scaring the pants off the enemy with such designs as Bambi's Flower wielding a mortar, Mickey throwing bombs from a plane, and hundreds more. 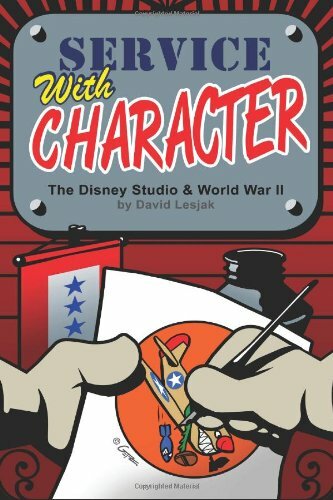 Get your kit together because we're marching off to war-together with Disney-in David Lesjak's Service with Character!